In addition to this Terra Universal Inc. 1911-18D, Capovani Brothers Inc stocks a wide range of used dry box, desiccator dry boxes. Typical manufacturers include Air Control, Inc., Contamination Control, DMS, Laminaire, Plas Labs Inc., and Terra Universal. To view our complete stock of used desiccator dry boxes, visit our Dry Boxes Category. 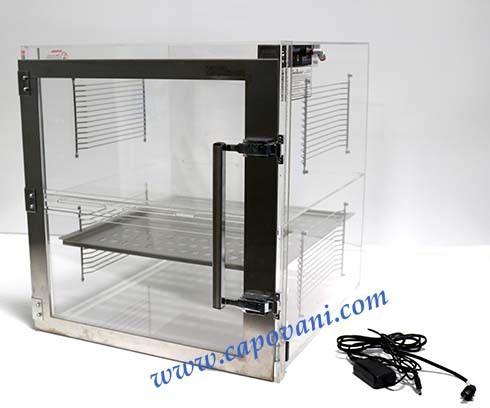 This used dry box and all the other used and refurbished semiconductor, scientific, and laboratory equipment listed on this website are owned by Capovani Brothers Inc. and stored at our facility in Scotia, NY. Terra Universal's SmartDesiccator maximizes yields of sensitive materials by automatically maintaining a user-determined humidity set point. Its quick-response feedback system continuously monitors the cabinet's relative humidity level and activates a purge of dry nitrogen only when it is needed. The system economizes on gas consumption and minimizes overpressures that can stress cabinet seals.